Identification: Becker (1983); Page and Burr (1991); Etnier and Starnes (1993); Jenkins and Burkhead (1994). Native Range: Great Lakes, Hudson Bay (Red River), and Mississippi River basins from New York and southern Ontario to North Dakota, and south to northern Alabama and southern Oklahoma, with an isolated population in southwestern Mississippi; Atlantic Slope from Potomac River, Maryland, to Roanoke River, North Carolina (absent in Rappahannock and York River drainages), and Mobile Bay drainage in Georgia, Alabama, and southeastern Tennessee (Page and Burr 1991). Table 1. States with nonindigenous occurrences, the earliest and latest observations in each state, and the tally and names of HUCs with observations†. Names and dates are hyperlinked to their relevant specimen records. The list of references for all nonindigenous occurrences of Moxostoma erythrurum are found here. Means of Introduction: Unknown. First appeared in the South Branch Potomac, West Virginia, in two tributaries in 1953. Not collected again until 1971. The first record from the Gauley system was in 1976 (Jenkins and Burkhead 1994). Status: Established in Maryland, Virginia, and West Virginia. Becker, G. C. 1983. Fishes of Wisconsin. University of Wisconsin Press, Madison, WI. Hocutt, C. H., R. E. Jenkins, and J.R. Stauffer, Jr. 1986. Zoogeography of the fishes of the central Appalachians and central Atlantic Coastal Plain. Pages 161--212 in C. H. Hocutt, and E. O. Wiley, editors. The Zoogeography of North American Freshwater Fishes. John Wiley and Sons, New York, NY. Tilmant, J. T. 1999. 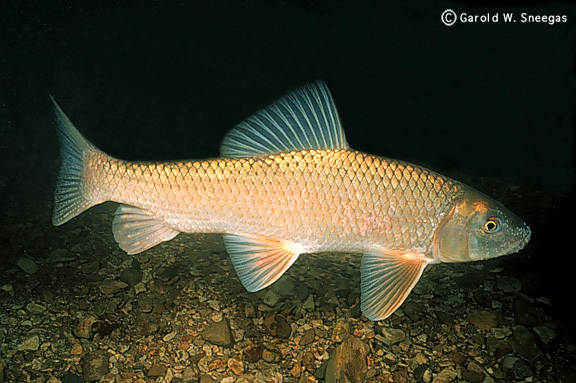 Management of nonindigenous aquatic fish in the U.S. National Park System. National Park Service. 50 pp.